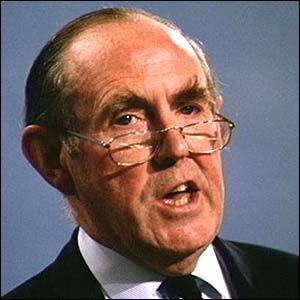 Terence O’Neill, then Prime Minister of Northern Ireland, travelled to London to meet James Callaghan, then British Home Secretary, to brief him on the growing violence in Northern Ireland. Peter Brooke, then Secretary of State for Northern Ireland, delivered a speech in Bangor, County Down, in which he sought to break the political stalemate by seeking to encourage a fresh round of inter-party talks aimed at restoring devolved power to Northern Ireland. In particular he stressed that sufficient “common ground” existed for progress to be made and urged Unionist politicians to resume contact with the British government. Whilst reluctant to make any commitment to suspend the Anglo-Irish Agreement (AIA) to allow for Unionists to engage in discussions, Brooke did hold out the promise that he would seek to work the AIA in a sensitive manner. A debate opened in the House of Commons, Westminster on the Northern Ireland (Emergency Provisions) Bill which was drafted to replace the Prevention of Terrorism Act and the Emergency Provisions (Northern Ireland) Act. The Bill contained a proposal on the videotaping of Royal Ulster Constabulary (RUC) interviews. Marjorie (Mo) Mowlam, then Secretary of State for Northern Ireland, went into the Maze Prison to meet Ulster Defence Association (UDA) and Ulster Freedom Fighters (UFF) prisoners in an attempt to change their decision to end their support for the peace process. Mowlam’s decision met with severe criticism from Unionist politicians. 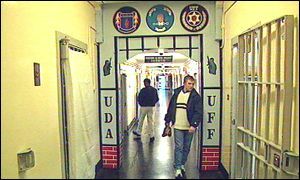 After the meeting, the prisoners agreed that the Ulster Democratic Party (UDP), the political representatives of the UDA and the UFF, should continue in the talks. Edward Kennedy, then United States (US) Senator, paid a visit to Derry and delivered a speech on the American view of the prospects for peace in Northern Ireland. There was a pipe-bomb attack on the home of a Catholic family in Larne. The device was thrown through the front window of the house but only partially exploded. A mother and her son were in the living room at the time but the two escaped uninjured. The Royal Ulster Constabulary (RUC) described the incident as attempted murder. The attack was carried out by Loyalist paramilitaries. There were confrontations outside the Holy Cross Girls’ Primary School in Ardoyne, north Belfast, during the early afternoon. Disturbances and rioting quickly spread to other surrounding areas and there was serious rioting in Ardoyne during the evening and into the night. Catholic parents and Protestant residents of the Glenbryn estate each claimed that the other side started the trouble. Catholic parents said that they had faced increased verbal abuse since Monday during their walks to and from the Holy Cross school and they were attacked while coming from school in the early afternoon. A Catholic mother claimed she was punched in the face as she walked home from the school with her child. Some Police Service of Northern Ireland (PSNI) officers said they arrived at a confrontation between a Protestant woman and a Catholic woman close to the school. The police moved to make an arrest but the person was protected by other residents. There was a report that some Loyalists had driven a car at the school gates in an attempt to enter the school. Police officers said they had to draw their weapons. 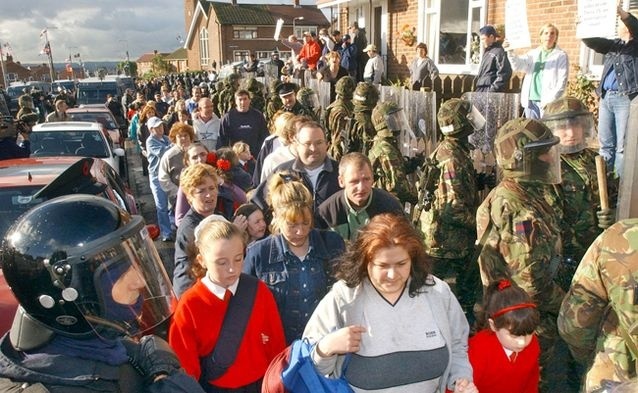 Some school children had to be taken home through another school while a bus carrying other children was attacked on its way down the Ardoyne Road..
Protestant residents claimed the trouble started when Catholics removed a wreath from a lamppost. Disturbances continued later in the afternoon: Loyalist youths petrol-bombed and destroyed a police vehicle; 4 Catholic youths were taken to hospital when they were hit by pellets from a shotgun at Hesketh Park; a number of Catholic homes were attacked in the upper Crumlin Road; Catholic youths petrol-bombed a car; a Catholic woman was knocked down by a car at the nearby Twaddell Avenue; a 13-year-old Protestant schoolboy was injured when a bus taking him home through the area was attacked, a Catholic man was struck by a police vehicle. During the evening the rioting became more serious and was mainly centred on the Nationalist end of the Ardoyne. The police fired 8 plastic baton rounds and three Catholics were injured. Three people were arrested. As the trouble further escalated, 200 police officers, backed by 200 soldiers, were drafted on to the streets. At least 14 police officers were injured during the evening. Up to 500 nationalists and loyalists were involved in the disturbances on the Ardoyne Road, Crumlin Road and Brompton Park areas and 130 petrol-bombs, acid-bombs, and fireworks were thrown. The Northern Ireland Arms Decommissioning (Amendment) Bill was given a third reading in the House of Commons, London. The Bill was introduced to extend the time allowed for Decommissioning of paramilitary weapons by one year, with possible annual extensions up to a maximum of five years. The Bill was opposed by Unionists and Conservatives who objected to the extra time and they forced a vote which was won by the Labour government by 357 votes to 142. 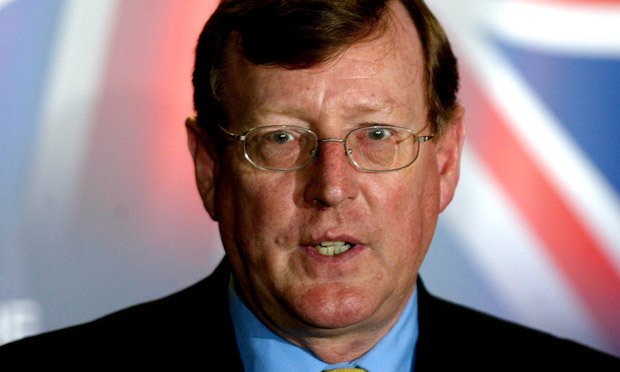 During the debate David Trimble, then leader of the Ulster Unionist Party (UUP), warned that if the government did not apply pressure on the Irish Republican Army (IRA) for continued decommissioning then he would. The current legislation only extends the work of the Independent International Decommissioning Commission (IIDC) to 26 February 2002. Killed by booby trap bomb left in shop, Gortnacarrow, near Newtownbutler, County Fermanagh. Off duty. Shot at his shop, Main Street, Castlederg, County Tyrone. Shot at his mobile fish and chip van, Airport Road, Moira, County Down.